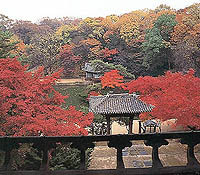 Built during the reign of King Taejong, the third monarch of the Joseon Dynasty, the king and the princes studied royal learnings and martial arts and also exercised here. 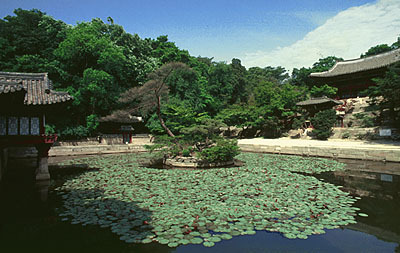 As the original structure of the royal garden remains almost unaltered and the grand trees dating back hundreds of years line the compound spotted by many ponds and streams, the Rear Garden of this palace shows an essence of the landscape architecture of the Dynasty. Passing quiet hilly lanes running from the Yongyong hall, Chihan pavilion over the crystal clean Okryu stream draws the attention of visitors. 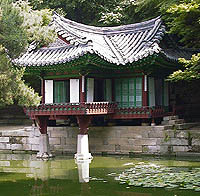 At the Uh-jeong, located on the left side of the pavilion, starts its bow-shaped narrow water course. 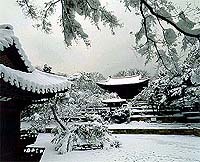 It was used by kings as their favored venue for outdoor feasts, during which wine cups were carried along the stream like at the Boseok pond in Gyeongju.